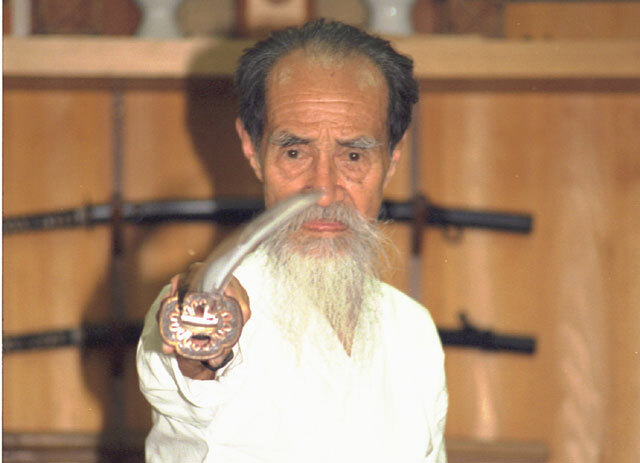 Yoshio Sugino, swordsman of Tenshin Shoden Katori Shinto-ryu, is respected worldwide as one of the elder statesmen in the world of Japanese kobujutsu (classical martial arts). Born in 1904, his life has paralleled much of the development of modern Japan, and during that time he has been fortunate enough to know and study under many of this century’s legendary martial artists. He has also provided martial arts instruction for many of Japan’s most popular historical movies, including Akira Kurosawa’s The Seven Samurai, adding dynamism and reality to what had been staid and poorly stylized fight-scene choreography. He has also appeared frequently in the media as a representative of the world of Japanese kobujutsu. 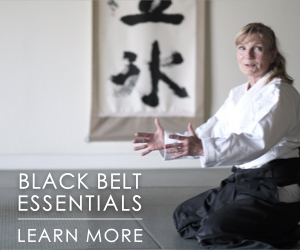 In such ways he has contributed much toward introducing the truly wonderful aspects of Japanese martial arts to the public. But despite Sugino’s tremendous service to the budo world, information on him has been limited to fragmented interviews and popular articles that do little toward painting a realistic portrait of the man himself, his origins and his history. 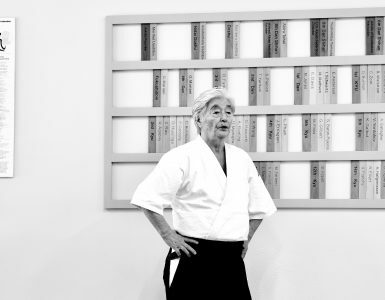 In this series I look back on Sugino Sensei’s life and the paths he has taken, along the way presenting some of the thoughts on bujutsu he has developed during his 92 years. “Mr. Sugino, we feel it may be necessary to amputate the arm. If we don’t, your condition could worsen and put your life in jeopardy.” The loss of an arm, for Yoshio Sugino, a man who had spent almost all his life as a martial artist, was practically a death sentence! Three of the five doctors he consulted viewed amputation as the best solution. Left unattended, they said, the blood-starved cell tissue would begin to die and the condition would only worsen. They had serious doubts about the capacity of Sugino’s 92-year-old body to recover on its own. Two doctors, however, urged that less extreme treatments should be tried first. Reluctantly, the others agreed and it was decided to trust the patient’s physical stamina and recuperative capacity. Shortly thereafter Sugino underwent surgery to sew together several of the blood vessels in his debilitated arm, a procedure that undoubtedly taxed his elderly body to the limit. As he woke from the anesthesia, in the hazy half-light of semi-consciousness, Sugino heard voices not just one but several. Voices that were somehow familiar. Opening his eyes, he was surprised to see his two surgeons and four nurses standing around the bed giving him three cheers. The operation had been a success. Sugino looked at his arm and knew that it could move again, perfectly freely, elbow, wrist, fingers, everything. Happy and amazed, he also noticed that the deathly pale of the flesh was gradually giving way to a pink hue as the rejuvenated blood flow began to resurrect the numbed tissue. Sugino was elated; he would be able to pursue his beloved bujutsu after all. Despite his robust constitution, Sugino’s age has taken its inevitable toll in the form of various physical failings. He has been forced to enter the hospital many times and earlier this year he was ordered to rest after his doctors detected a mild stroke. But Sugino remains as tough and tenacious as ever. Although he now refrains from training himself, whenever he is at home he can still be found in the dojo among his students, bokuto in hand, flinging sharp critiques and guidance on this point or that. He still goes up and down stairs on his own, refusing assistance from family members. His posture is still as steady and straight as a rod. He still has most of his own teeth, and he still eats whatever he likes. In short, he is doing pretty well, all things considered. 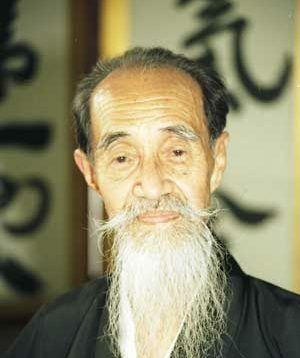 Sugino was born in 1904, a year considered by classical Japanese astrology to engender good luck to those born in it. A look at a few of the details of his budo career will confirm that phenomenal good fortune has indeed been his throughout his journey. Doctors saved his arm. He got through the war without being called up. despite top examination results. 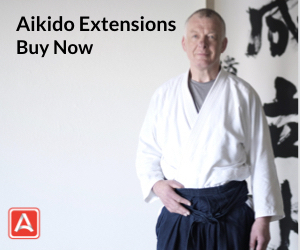 Throughout a long career he has enjoyed close contact with many of the most prominent, most talented martial artists of our century, Jigoro Kano and Morihei Ueshiba among them, and he has managed to lead one of the fullest lives a martial artist could ever ask for. Of course, Sugino has had to overcome his share of hardship as well, but bujutsu has supported him through all such difficulties, serving him well as the core of his physical and spiritual being. 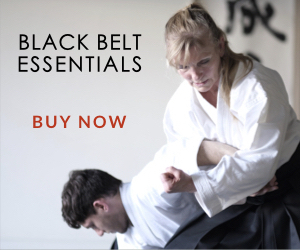 These days he is regarded as one of the precious remaining living witnesses to the world of Japanese kobujutsu and is loved and respected as a teacher. And, despite his advanced age and long years of experience, behind his penetrating glare remains the same impish grin that as a youngster earned him a reputation as “that little rascal!” and that nowadays simply enchants and fascinates. Early years Sugino was born on December 12, 1904 in the village of Naruto (a farming village just inland from Kujukurihama in Chiba Prefecture), the eldest son of Yutaro and Seki Sugino. Born slightly smaller than average, his determination to become strong undoubtedly began to surface at an early age. The Suginos were a farming family that for generations had served as the head household in the village. From the Edo period, the family had been permitted to use a surname and wear a sword. Their house was a sprawling affair with a cemetery in the rear where slept generations of Sugino family ancestors. Today the house is still maintained by one of Sugino’s cousins. When Sugino was still very young his family moved to Shirogane Sanko-cho in Tokyo’s Minato Ward. His parents, already well aware of the boy’s proclivity for mischief, arranged to enroll him in elementary school at the age of six, a year earlier than normal. The young Sugino created quite a stir at the traditional entrance ceremony by arriving dressed in western-style clothing highly unusual and perhaps a first for the school in an age when Japanese-style garb was considered normal and proper on such occasions. As mentioned earlier, Sugino was a little smaller than the other boys, but he had an abundance of energy and took something of a leadership role when it came to making mischief. He was not particularly fond of studying, preferring to stage mock sword fights and the like with his friends. Sugino’s father was extremely strict and the boy knew he could look forward to a cuffing should he fail to answer immediately when called. The elder Sugino valued hard work and despised anything that was not fair and above board, and taught his son accordingly. The boy grew up to have a good deal of fortitude and always kept a stiff upper lip, then, as now, quite imperturbable. Initiation into bujutsu Sugino first encountered the martial arts after entering Keio University in 1918, where he was enrolled in the Department of Commerce and Industry. Standing only 159 centimeters and weighing a slight 56 kilograms, what he lacked in build he has always made up for in energy. He threw himself diligently into many club activities including, of course, those related to martial arts. 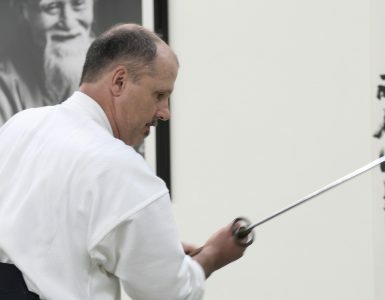 “I was in just about every club there was,” he recalls, “judo, kendo, kyudo, sumo and quite a few others. I’d join just about anything I was asked to.” (Students in most Japanese schools are required to take part in at least one club meeting per week and may join others if they wish. Such clubs are a significant part of Japanese school life in all grades.) He was particularly active in the boating club and in some clubs that would be inconceivable in Japan today, such as the pistol club. “I remember shooting at a pigeon in the school yard, but I missed,” he says. Unlike modern Japan with its strict gun control laws, back then, it seems, there was more freedom to own a pistol. Sugino remembers his university days fondly. He describes walking with a friend through the fashionable Ginza district, the atmosphere there alive with the cheerful optimism and freedom of Taisho-era democracy, the two of them swaggering through the crowd, surveying the scene with the confident delight and natural curiosity of youth. In his heavy Tokyo accent, Sugino describes the time he brought a friend from the country to a Tokyo coffee shop: “Having been raised in the country, my companion found coffee quite exotic. He also thought it was simply marvelous that you could put in as much sugar as you liked.” Sugino was and still is a keen observer of detail. While watching a Waseda-Keio baseball game, for example, he noticed that all the Waseda students had brought rice balls for lunch while all the Keio students had brought sandwiches. This talent for observation undoubtedly helped him a great deal in learning martial arts. Later, when teaching his own students, he became known for never missing even minor mistakes and pointing out each and every one in a distressingly loud voice. Although he tried practically every sport available, Sugino’s real love was for budo, particularly judo and kendo. While at Keio, he began studying judo under Kunisaburo Iizuka, an 8th dan judoist who also taught at the Kodokan. Iizuka was even shorter than Sugino but he made up for his lack of height in his girth and exceptional skill. It was he who forged the young Sugino into a strong judo man. At first, Sugino was unable to win against any of his opponents because of his small size. “That was truly a difficult time for me,” he recalls. 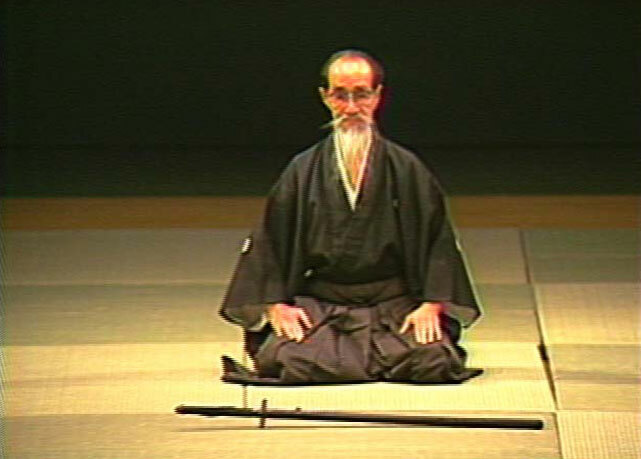 Sugino studied kendo for a time under a man named Tadatsu Shingai, who was employed in the Imperial Household Agency and was ranked “upper second kyu.” The dan system was not used at that time and practitioners were ranked instead from tenth kyu to first kyu, which ranks were further divided into upper, middle and lower levels. Given that a third kyu was roughly equivalent to a modern 4th dan, Shingai’s upper second kyu rank suggests he had considerable skill. Although Shingai urged Sugino to train seriously, Sugino seemed to show little aptitude for kendo (perhaps it did not quite fit his nature then) and he made little progress. After a while he decided to give it up. Once there was a judo tournament between Keio University and the four-school alliance comprised of Kuramae Engineering University, Tokyo University of Agriculture, Rissho University and Tokyo University of Fisheries. The Keio team being short on members, Iizuka arranged for Sugino to participate despite the fact that he was still only a first kyu. His opponents were all huge black-belts. But Sugino stepped onto the mat wearing his brown belt and threw his way through six of them, with the seventh match ending in a draw. Afterward his teammates crowded around him congratulating him: “You’re so small, but you fought so well in there! Even Iizuka Sensei thought so.” He came away from the tournament with unprecedented new confidence. At the end of that same year Sugino took his shodan exam at the Kodokan on Iizuka’s recommendation. This time he defeated six opponents in a row, earning for himself the rank of “shodan with honors”, a rank which existed at that time and indicated performance above and beyond that required for an ordinary shodan. From then until earning his 4th dan, Sugino remained undefeated. Even in elimination-type series he would inevitably wind up first or at least in a draw with the last opponent. One of Sugino’s favorite judo techniques was utsurigoshi (hip shift), a somewhat acrobatic technique in which the opponent’s throwing power is taken advantage of to throw him instead. 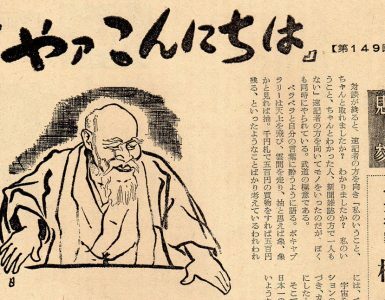 He was also fond of urawaza (rear techniques) and kaeshiwaza (reversals) and always exploited openings left by opponents who carelessly underestimated him because of his small size. But more than anything he had the confidence that his teacher Iizuka had planted in him. In Part Two of this series (coming soon), we learn of Sugino’s waning enthusiasm for judo and his first encounter with Katori Shinto-ryu at age 22. 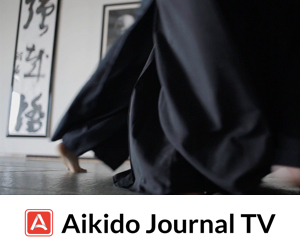 Watch Yoshio Sugino lead a 40 min lecture demonstration on Aikido Journal TV.